In this article alone, we have given you a lot of app recommendations and you've probably already installed most of them for a test run. Who knows have many more you've installed in your own quest for finding the perfect apps for your needs. As a result, the last thing you'd want to happen is for you to lose it all and have to start the search all over. Granted, the Play Store keeps a history of all the apps you've ever installed, but you'd have to go and install them one by one. That's tedious and frankly, not necessary. The smarter way is to have a backup tool that creates a large restore point for your Android smartphone, in case things go awry. Here are some of our favorite utilities designed to keep your sanity in check when disaster strikes. One of the way to perform a backup of your entire smartphone is entering into the so called Custom Recovery mode. This is a special mode, where you can perform administrative operations to your smartphone. Each smartphone has a different way of entering custom recovery mode and it's usually by pressing a combination of buttons on your device. On the Samsung Galaxy Nexus, for example, press the volume up and volume down keys at the same time and then (while holding them) press and hold the power on/off button. After a few seconds you'll be prompted to select to enter custom recovery mode. Once there, you can perform special operations. One of them is installing custom ROMs, performing a factory reset and wiping all your data, deleting cache and mounting additional storage. Entering this mode also allows you to perform full "nandroid" backup of the device. A Nandroid backup saves not only all of your files and apps, but also all of the system files and apps. This way you have a full system image, which you can restore at any point in time. It is a good practice to perform a full nandroid backup after you've set up your smartphone and installed the all of the apps you wanted. If entering into custom recovery mode doesn't sound like your cup of tea, there's a simple, yet very useful app called ONLINE NANDROID. It performs the elaborate Nandroid backup method without the need of entering into custom recovery mode with just a tap on a button. Keep in mind, though, that the app requires your smartphone to be rooted and have the BusyBox app installed as well. The app also shows you all of your previous backup files, but unfortunately it can't perform full restores. This could be done only in the custom recovery mode. Undoubtedly, that's one of the best apps for backing up your apps and all their private data. You can either manually select which apps should be backed up or just have them all saved to a predefined location (SD card or phone memory). The app, however, requires your device to be rooted, so keep that in mind before installing it. The paid version of the app has the cool feature of creating a .zip file with all of the installed apps and their data for quick restoring. However, you can manually select specific apps which you want to be backed up instead of waiting for your whole app library. Unified remote is a tremendously useful app for controlling your PC via your home Wi-Fi, provided they are both connected to the same network. The app is essentially a list of separate remote controls for different programs on your Windows desktop PC combined in one (Linux and Mac OSX versions are in development). 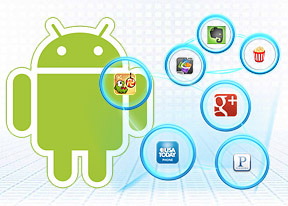 In order to make the connection, the app requires you to install a "server" program on your Windows PC, with which the Android app establishes connection. Once connected you can choose from basic touch or keyboard input to app-specific remote controls such as Chrome, Windows Media Player, Winamp, Power Point and much more. The full version of the app comes with even more remote controls, and is really worth the money (currently $3.99) if you don't like getting up from your couch to just adjust the volume of the movie you're watching. Taking remote control of your PC one step further, Team Viewer allows you to access your PC wherever you are as if you're in front of it. Free for private use, the app requires you to install its desktop version (Windows, Mac OS, Linux are supported) before establishing a connection. Each session benefits 256 bit AES encoding, so you could be sure no one is sniffing what you're doing with your PC. The app supports file transfers, scroll wheel and zoom (using gestures) as well as the standard left and right clicks. You can remotely reboot or maintenance your PC or that of a relative. You can also set up access to multiple computers. Overall, TeamViewer is a must have for anybody who wants to have full control of their PC wherever they are. We discussed how to use your Android to access your computer, but how about the other way around? For those wanting to fiddle with their Android smartphone via their PC there isn't a second app that does the job as flawlessly as AirDroid. All you need to do is have your Android smartphone connect to the same network as your desktop computer via Wi-Fi. That's all the preparation you'll need to do. Launch the app and follow the straightforward onscreen instructions. Once in, the app generates an almost desktop-like view of your Android phone with its main apps listed as icons and handy information such as available storage and battery indicator sitting comfortably on the top right screen. You can do pretty much everything from here - playing music, moving files around or even sending SMS and managing contacts. If you've been searching the Play Store for the perfect clock widget, but not even one has caught your eye, then look no further than Ultimate Custom Widget. The app allows you to create your own widgets from the ground up giving you virtually limitless possibilities. You can control the components of the widgets including weather, clock, date and much more. Colors, sizes and fonts are also user-configurable. There are many presets you can start fiddling with in the quest of creating the clock widget that right for you. The app is free and at first might seem a bit confusing but in just a couple of minutes you'll be able to create some truly unique widgets. UCCW is definitely the app for creating custom widgets for your droid. In case you've got some untapped power under your Android's hood, we suggest you take your homescreen past the boring look and feel of a static wallpaper and explore some of the most interesting live wallpapers that Android is famous for. We should mention that placing a live wallpaper instead of a static one will eat your battery noticeably quicker. There are countless live wallpapers out there and we can't say we've tried them all, but here are some of the best ones as per our humble opinion. Just like its name suggests, Fresh Leaves is a pretty cool live wallpaper with 3D leaves, which do cool animations. You can choose among spring-, summer-, autumn- and winter-styled leaves. If you want to showcase photos of your dearest people or just make a collon your homescreen, then Photo Wall FX is for you. The app generates a photo collage of specific photos of your choice. GyroSpace 3D puts an interactive 3D space scene as your live wallpaper with cool effects and many customizable settings. Perfect for the winter season, the Snowfall live wallpaper makes it rain snow in your Android homescreen. Not literally, of course, but pretty realistically nevertheless. Mystic Halo is a cool, honeycomb-inspired live wallpaper with abstract look and feel. Fan of lightnings? The Thunderstorm live wallpaper will give you plenty of them mixed in with great looking, constantly moving scenery of clouds.